There are more than 1.3 million fires that take place in the U.S. every year. Many of these blazes start inside houses and put homeowners, their families and their properties at risk. The good news is, there are effective steps you can take to protect your family and your home in the event of a fire. Cross the following items off your home fire safety checklist today. Make sure smoke alarms are installed throughout your home. If a fire starts in your home, you want everyone to know about it as quickly as possible so that they can escape in a timely fashion. Smoke alarms can help alert you and your family to the presence of a fire, but only if they’re properly installed. You should have at least one smoke alarm on every floor in your home and an alarm inside each bedroom. This will ensure your smoke alarms are able to detect isolated fires before they spread to other parts of your home. 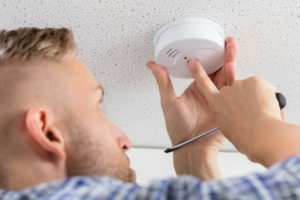 Test smoke alarms and replace the batteries accordingly. Installing smoke alarms throughout your home is smart, but they won’t do you much good if their batteries are dead. With this in mind, it’s a good idea to test all the smoke alarms in your homes about once a month to make sure they’re working. If there are any that don’t have functioning batteries, replace them right away. You should also replace your smoke alarms about once every 10 years. Create a fire escape plan and practice it. If a fire were to start in your home right now, what would everyone do? If you don’t have a fire escape plan in place, your family members may panic and not know where to go. Sit down with your family and come up with a fire escape plan that works for everyone. Practice it about once a month so that it becomes routine. In addition to taking these steps, you should also consider having an electrical inspection conducted to ensure your home’s electrical system is safe and up to date. To learn more, feel free to give us a call at (773) 429-9711 today. Monday – Friday: 8:00 a.m. – 6:00 p.m.
Saturday and Sunday: 9:00a.m. – 5:00p.m.